All year long BeeBop and I look forward to one special time during the summer. 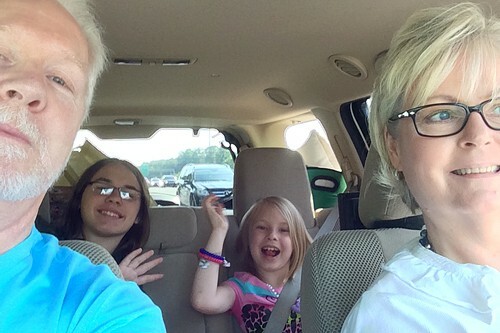 The few weeks we get to spend with our grandchildren! Each year we get them all to ourselves for a little while and we always try to plan something memorable to do while we’re together. This year we decided to go someplace none of us had ever been. 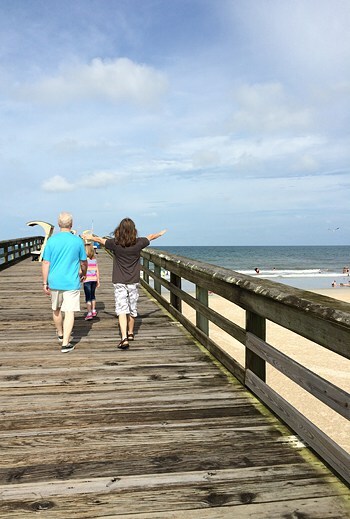 When we started asking around among friends and family, the overwhelming response was to visit St. Augustine, Florida. I couldn’t believe that in all our traveling around, neither of us had ever been there. Of course, we’d both learned about St. Augustine in history classes. 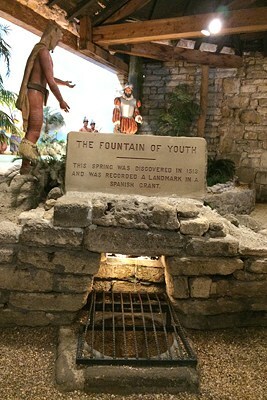 We knew about Ponce de Leon and the Fountain of Youth. We knew that it is the oldest continuously occupied European settlement in the United States. And we knew that it had miles and miles of beaches. However, we really didn’t know the extensive historical significance of the area. And we had no idea how much there is to see and do there! If you’re a history lover, like me, you’ll be head over heels with St. Augustine at first sight. If you’re a beach lover, you’ll be crazy about the beautiful beaches. I was initially worried that the kids would be bored but I quickly found out how wrong I was! St. Augustine is nothing like most of the very touristy beaches we’ve visited before. You won’t find the typical go-cart tracks and mini-golf courses lining the streets. It’s an absolutely beautiful city which is immensely proud of its history and, oh yeah, there are gorgeous beaches there as well. There are so many sights to see in St. Augustine that we almost didn’t make it to the beach. One of the first things we did was a tour of the St. Augustine Pirate and Treasure Museum. I wasn’t sure quite what to expect at the Museum. I was almost expecting a cheesy, kid-centered, comic book-ish place more Jack Sparrow than real history. I was so wrong! 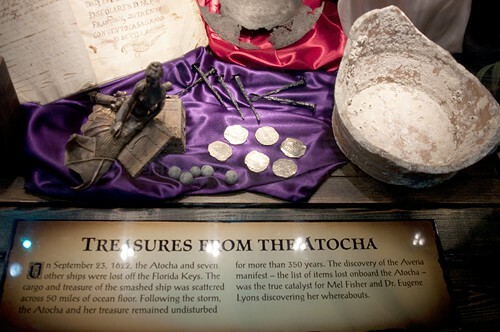 The St. Augustine Pirate & Treasure Museum is a unique collection of authentic pirate artifacts coupled with interactive technology that illustrates the Golden Age of Piracy and the lives of the era’s most infamous pirates. Among the collection of more than 800 museum-quality artifacts, is the original journal of Captain Kidd’s last voyage and the oldest pirate Wanted Poster for the capture of Captain Henry Every. 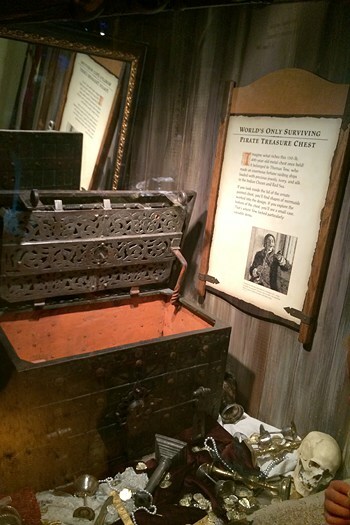 In addition, the collection contains the only existing authentic pirate treasure chest in the world that originally belonged to Captain Thomas Tew. 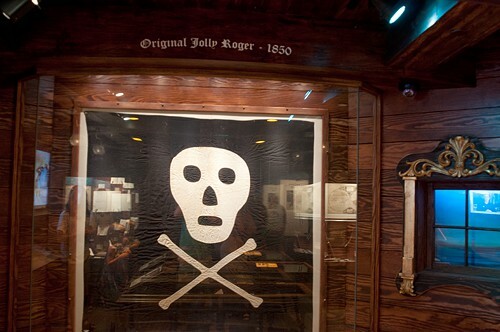 There’s also one of three surviving Jolly Roger flags on display. 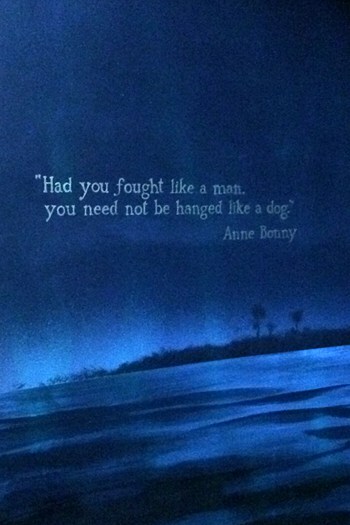 One of the most fascinating things I learned at the Museum was the story of two female pirates – Anne Bonny and Mary Read – both members of Calico Jack Rackham’s crew. I didn’t even know there were female pirates! 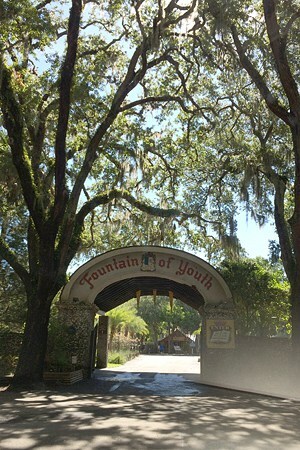 Of course, you can’t visit St. Augustine without going to the Fountain of Youth. Again, I was expecting something far less than what we experienced. There was, of course, the Fountain of Youth spring where you can drink the supposedly magical waters (I had three cupfuls by the way – still waiting for the magic to happen) but the Fountain of Youth site is so much more! Its 15 acres encompass not only the spring, but is the site of the original Spanish settlement founded in 1565 by Pedro Menendez de Aviles. That’s 55 years before the Pilgrims landed at Plymouth Rock and 42 years before Jamestown was colonized. 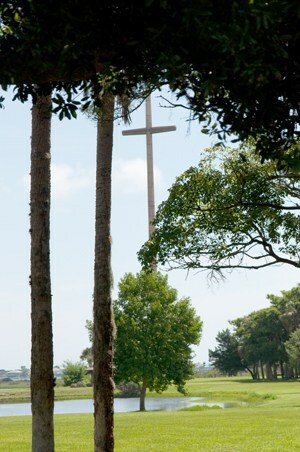 The spot where Menendez landed is commemorated by a striking 280-foot cross. The Mission of Nombre de Dios Church, the first Christian church built in the continental U.S., is within the Fountain of Youth site. Also on the grounds are a planetarium, a riverwalk, a watchtower, and dozens of free-roaming peacocks. There are ongoing archeological excavations with interpretations and demonstrations of antique firearms and cannons. We could have spent a lot longer at the Fountain of Youth site but we pressed on. We were very lucky to visit St. Augustine while El Galeon was docked there. 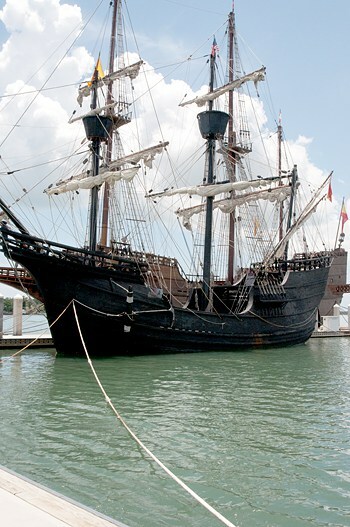 El Galeon is a 1/1 scale replica reconstruction of a 16th Century Spanish galleon. Spanish galleons, used primarily for their cargo transporting abilities, were frequently bought and sold by Spanish and English governments during the 1600s, and often taken over and converted into Pirate ships in the rough Carribean sea waters. El Galeon was sailed to St. Augustine from Spain to commemorate the arrival of Juan Ponce de León on the Eastern shores of Florida. Touring El Galeon was definitely one of the highlights of our trip. 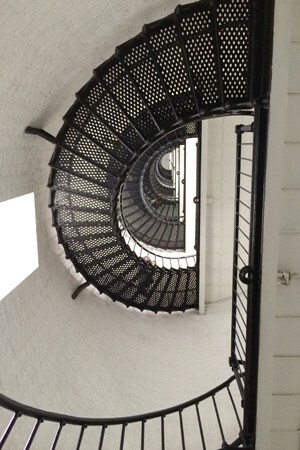 Next up on the agenda was a tour of the St. Augustine Lighthouse and Museum. 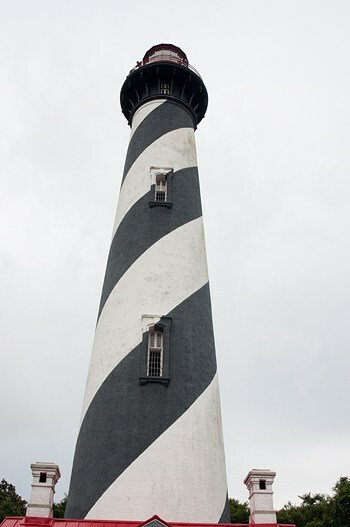 At 126 years old, it is one of 30 lighthouses standing in Florida and one of just six open to the public. Visitors can climb the 219 steps to the top for a panoramic view of St. Augustine. There are extensive museum displays in both the lighthouse and the keeper’s house. I chose to explore the displays while BeeBop and the grandkids climbed to the top. 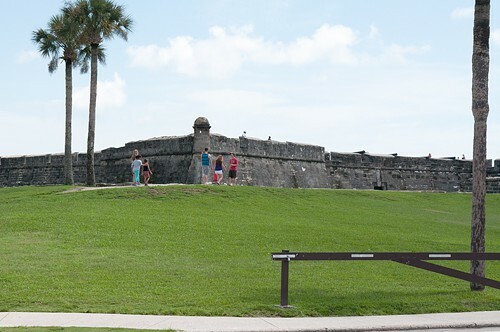 One of the last tours we took before heading home was a visit to the Castillo de San Marcos. It’s the oldest masonry fort in the continental U.S., built in 1672 to protect the town and the treasure fleets on their way home to Spain. There are daily demonstrations of Spanish military life including musket and cannon firings. The artifacts on display at the fort were fascinating! 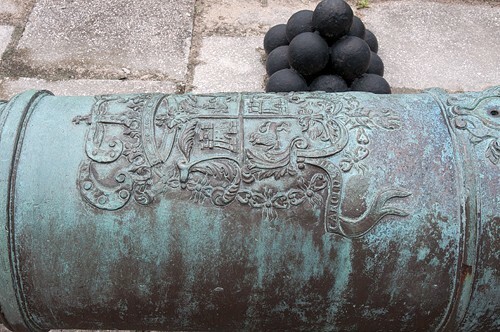 Can you believe the beautiful workmanship on this cannon? There were displays that depicted the every day life of the soldiers who lived in the fort, the uses of all the different areas within the fort, and loads of information about the major personages who played a role within the fort during its lifetime. Possession of the fort has changed six times, all peaceful, among four different governments: the Spanish Empire, the Kingdom of Great Britain, the Confederate States of America and the United States of America (Spain and the United States having possession two times each). As much as we enjoyed our few days in St. Augustine, I felt like we barely scratched the surface of the historical and recreational activities of Florida’s Historic Coast. I’d love to return for a longer trip one day! Many thanks to the St. Augustine Visitors and Convention Bureau for their assistance in helping us plan a wonderful vacation! Ms. Joanne – thank you so much for instilling a love of history in me all those years and years ago. If I had it to do all over again, I’d major in history and probably work in a museum somewhere! I went there as a teenager but, as that was 40+ years ago, don’t remember much. Would like to go again! Sounds like a very enjoyable trip!! Sara, we absolutely loved it! Without a doubt, one of the most interesting places we’ve ever visited. What nice grandparents. This looks like an amazing trip. I have never been to Florida….hope one day to visit. 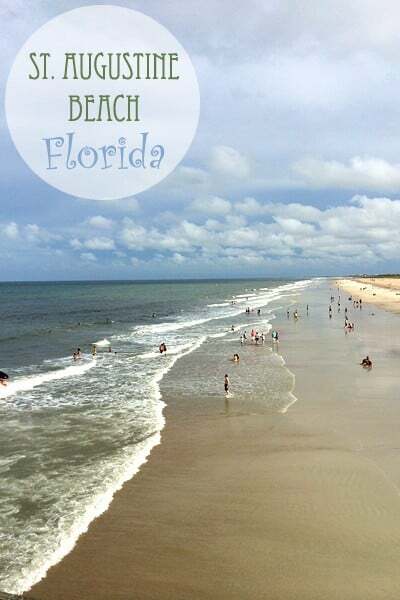 My husband and I both grew up in south Georgia and spent many, many summers going back and forth to the Florida gulf coast beaches. However, we had somehow never visited the St. Augustine area! We’re both really happy we chose it for our family vacation this year. Hope you get to Florida one day, too! Oh, I am so glad that Ms. Joanne said hello! She absolutely challenged the starch out of me in high school. I loved going to her class, and learning about people, places and how circumstances combine those elements to form the high water marks in time. Come to think of it, I kind of deal with all of that every day. So glad y’all had a good time. Send me some more photos. Great post, Lana. I love St. Augustine too. On the subject of female pirates, may I suggest the book, Cinnamon and Gunpowder: A Novel by Eli Brown. The characters are a female pirate ship captain and a chef. It is a wonderful adventure, romance, and food story. I couldn’t put it down. PS–who doesn’t hate driving in Atlanta? What an awesome trip- looks like a great place to bring the family!! If you are a reader, Eugenia Price wrote an historical Florida trilogy. The one title Maria is about the woman who lived in the oldest house. It really brings St Augustine down to a personal, living level. St. Augustine is one of my favorite places too. Onisha – I saw that series on Amazon and wondered if it was good. Thanks so much for the recommendation! I’m definitely ordering it now. It is an old series, been around for years. I hope you enjoy it as much as I did.